Effective December 1st, 2018, only a couple of days from now, WHMIS 1988 will be obsolete and the new WHMIS 2015 standard will be enforced across Canada. Here is what you need to know before the changes come into effect. There may be different people involved in getting a product from fabrication to destination, and each of them have different roles under the new WHMIS. Distributor: a Canadian supplier to whom a hazardous product was sold, and who then resells the hazardous product without modifying it in any way. If a distributor does modify a hazardous product that they purchased (for example, by repackaging or relabeling it) and subsequently sells it, then the distributor meets the definition of a “manufacturer””. The Hazardous Products Regulations set out specific hazard classification criteria that determines the class and category of hazardous products. This also determines which WHMIS/GHS pictograms must be displayed on labels and Safety Data Sheets (more on these later). 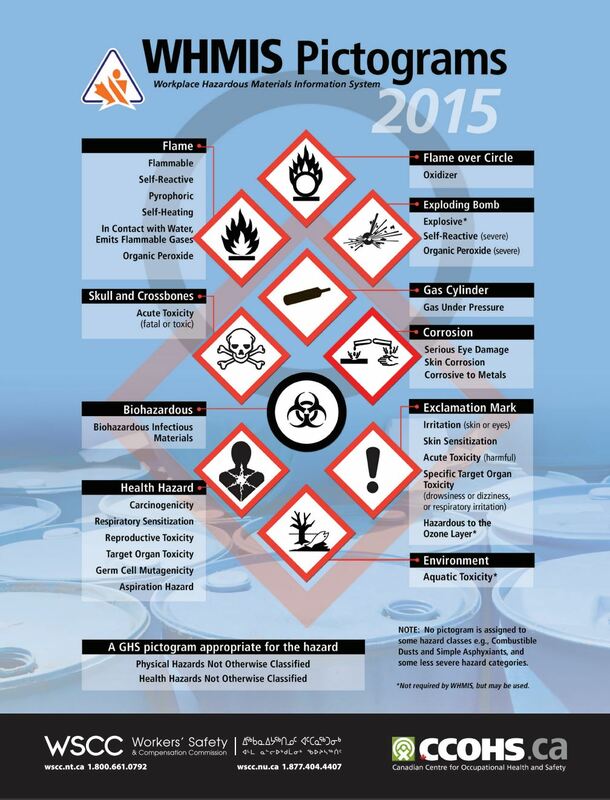 The Government of Canada WHMIS 2015-New Hazardous Products Regulations Requirements defines and explains these hazard classes and their requirements in a lot more detail, but for the purposes of this post, we'll just give you a quick overview of which types of products belong in each category. This is the last major change we are going to highlight in this post. A Safety Data Sheet (SDS) is very similar to the Material Safety Data Sheet (MSDS). Their purpose is to provide a summary of the hazards and safety precautions associated with the product. So how have things changed? It has more to do with the validity of the SDS than the actual information. Under the old legislation, MSDS were considered to be up to date and current if they were less than 3 years old. Unfortunately, when MSDS were expired and no changes had been made to the product, purchasers were not always supplied with more current paperwork, leaving them non compliant under WHMIS 1988. Under the new WHMIS regulations, suppliers are responsible for making sure that all products are sold with a current SDS and that the information is updated as soon as they are made aware of any changes. These modifications must then be passed along to purchasers within 90 days. We think there are more than a few companies who built their brand names around MSDS who have a have a hard time ahead of them when it comes to changing their brand. While the system hasn't changed too drastically, there are still a few things that will take some time to get used to. However, if everyone does their part and embraces their responsibilities under the new WHMIS 2015 regulations, workplaces across Canada, and everyone in them, will be a little bit safer than yesterday.